We are able to supply a service to fumigate your equipment or you can buy the equipment from us and do your own fumigations. This type of boiler is able to fumigate most types of equipment and has a maximum liquid capacity of 250ml. The boiler features a constant boiler temperature system that means when full or nearly empty the rate of boiling remains constant. This prevents problems with the liquid boiling over when the bowl is nearly empty. To carry out fumigation the boiler needs to be placed inside the safety cabinet. 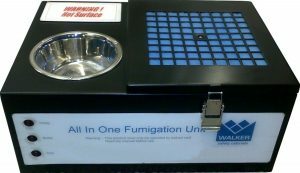 We use our own unique ‘All-In-One’ method of fumigation, which is effective for all makes and models of Safety Cabinets. Our All-In-One unit has a built in boiler and carbon filtration system. It is placed inside the work area to do the fumigation and is less than 200mm tall so it be slotted inside a typical safety cabinet opening of 200mm without opening the door further. A maximum capacity of 30ml of formaldehyde and 30ml of water can be used. Each time the All in one unit is used the carbon granules inside the unit require replacing. A new canister of carbon granules is cheap to buy and means the carbon is always fresh because typically carbon granules have a typical shelf life of about 18 months. We always stock carbon granules so they can be delivered quickly if required. It works by carrying out the following steps. When the boiler is powered up it starts a 10minute delay period, this allows the user to do any final sealing before the boiler starts. The boiler then runs until all the liquid has boiled away, the boiler then latches off and remains off until the boiler is next used. The all in one unit then sits dormant for 8 hours to allow the fumigant to fumigate the unit. After the 8 hour dwell period the built in fan runs and draws the fumigant in the air through the carbon filtration system. The system typically takes about 10 hours to bring the fumigant in the air down to a safe level. However this can vary depending on how the unit is being used. It is recommended to do a ppm level test to see if the levels are below accepted safe limits before accessing the interior of the unit being fumigated. 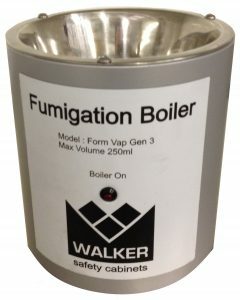 For whole room fumigations we can offer the use of a 2 litre or 9 litre boiler. A 2 litre boiler would be suitable for rooms up to 54m3 and a 9 litre boiler would be capable of fumigating up to 243m3 based 100ml of formaldehyde to 900ml of water for every 27m3 of room space. The boiler features a constant boiler temperature system that means when full or nearly empty the rate of boiling remains constant. This prevent problems with the liquid boiling over when the bowl is nearly empty. To carry out a fumigation the boiler needs to be placed inside the room. Any room being fumigated must be suitable for fumigation, it is essential that the room has been sealability tested prior to fumigation. A room leakage test is also recommended and a safe means of sealing and venting the room must be available. Contact us today to enquire about fumigation, and how we can provide the service for your premises and equipment. 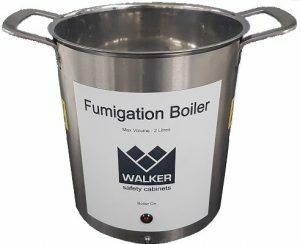 Formaldehyde fumigations are potentially dangerous, anybody carrying a fumigation must be suitably trained. A full risk assessment should be carried out and a method statement should be produced.